Hello, and good morning to you! It's a beautiful day!! It's time for another Peachy Keen Challenge, and this week our challenge is to use purple, blue, three snowflakes and a sentiment. I think I managed to accomplish all of that here, however I had quite a time, because purple would be a color that I have very little of in my stash of paper. Note to self: MORE PURPLE PAPER! I did find this K& Co. paper in my collection, which has a faint strip of Pale Plum in the plaid. I love, love this paper. This What's Snow Funny image PK-19 has to be my all time favorite image EVER! I have tole painted this little guy from Kathy's Paint On A Happy Face books for years. I actually found a wooden sled the other day, where I had started painting this little guy, and never finished it. That's on my list of things to do before Christmas. I'll have to share it with you when I'm all done. I will need to find my tole painting books, first, though, since those are all packed away. I haven't tole painted for probably 5 years. I hope I haven't forgotten how to use acrylics!! I colored this funny fella up with my SU inks and an aquapainter. There's a whole lot of sponging going on along the edges, and a good dose of bing too. Oh, how I love my bling!!! This was a great challenge, and I'm starting to get a good start on holiday/winter cards with the challenges lately. 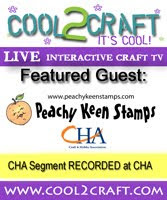 Please be sure to play along with us at the Peachy Keen Challenge Blog. There are always drawings for great prizes if you play along! Let's see where this creative challenge leads you!! Also, be sure to check out the wonderful samples from the rest of the Design Team girls. Their talent will knock your socks off! Thanks for stopping by today! As always, it's a pleasure to have you visit. I hope you've found some inspiration, and that you'll find time to play with us. I wish you a day filled with family, friends, fun, and of course, happy stamping!! May you be showered with blessings today and always! Beautiful card, love this image, so.. cute. Popped over the challenge blog, but the challenge isn't listed yet. Will pop back later. How do you do it?? Homerun every time. Omgosh! This is amazing!! The background of your scene is incredible. Teach me teach me! Wow, this is stunning! You are such an artist! I agree with every single comment left here, and I want to be you too! Absolutely stunning! This is scene and your coloring is just soooo breath takingly beautfil Lorie! Purple is my favoritist color ... I love this card and 'ditto' on Catherine and Kadie's remarks. You are one terrific mentor in the water coloring department. GO LORIE!!!!! This is such a terrific holiday card and such a subtle little hint of purple, it does a smash up job! And gaaaaaaaaaah on your coloring!! You are truly an artist working one masterpiece after the next! Such a gift you share with all of us! Blessings! Dear Lorie.. I can't even find words to describe how good you make me feel with your posts! You can paint circles around me, my friend! Really - this card is SIMPLY AMAZING!!! That paper is beautiful btw.. the bling is perfect. I just imagine that you have this cute little magic bag that you pull the perfect embellishments out of every time! HA HA... Thank you, Lorie! You are a blessing in SO many ways! What a cute card! I just love these little faces & little snowmen! So cute! I just wish I could color as well as you do! This is incredible Lorie. Your coloring and sponging just bring this image to life.. Really great job.. I have never tole painted and would love to learn.. Super sweet card..
Oh girlfriend....Watch out Picasso! I thought I was ready to put my order in for some new stamps until I saw this card....Now that I saw this I gotta buy this stamp! But my gosh...mine won't look anything like this treasure...I think I was to get on your christmas list! I LOVE this image and your beautiful card. You rock Lorie. I love everything you do!!! Magnificent colouring and I love the card! beautiful!! Poor snowman, but the coloring is a dream.